As directed, I am to upload Academic Calendar 2016 and Holiday list – 2016 along with chapter-wise division of all subjects for the classes IX and X to be taught in 1st, 2nd and 3rd summative evaluations for your kind information and taking necessary action. 10-50 HRS. 11-30 HRS. 1ST PERIOD 40 MINS. X 4 = 2HRS. 40 MINS. 14-10 HRS. 14-45 HRS. 5TH PERIOD 35 MINS. X 4= 2HRS. 20 MINS. TOTAL HOURS: 10-40 HRS. TO 16-30 HRS. – 5HRS. 50 MINUTES. 5 DAYS (MONDAY TO FRIDAY) – TEACHING – LEARNING HOURS – 5 HRS.X 5 = 25 HRS. TOTAL – 27 HOURS 40 MINUTES + 3 HRS. + 20 MINUTES (RECESS) = 31 HRS. 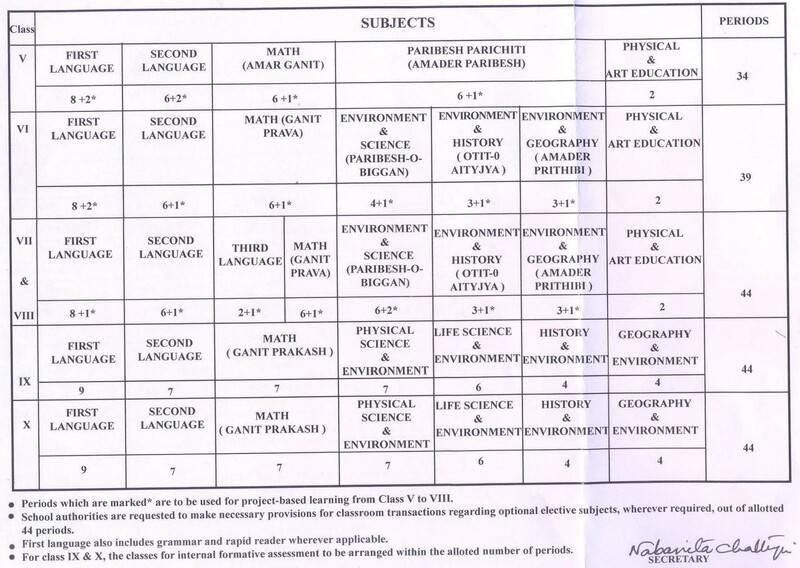 Periods which are marked * are to be used for project-based learning from Class V to VIII. School authorities are requested to make necessary provisions for classroom transactions regarding optional elective subjects, wherever required, out of allotted 44 periods. For class IX & X, the classes for internal formative assessment to be arranged within the alloted number of periods.